Beautifully crafted surveys that deliver deep insights. We know how frustrating it can be when your survey platform doesn’t give you the question format you need. With a custom-built survey, anything is possible. Sometimes you need more than a simple list of questions with predefined options. Complex loops make it possible to collect everything you need with one survey. Ask people to identify which levers would move a system, then circle back and ask who is influential around those levers, and finally collect details about those influential people. We’ve collaborated with experts in social network analysis and systems science to bring you tested and proven approaches for using surveys to collecting insights. Use our SNA or root cause templates as a starting point and customize to your particular context. 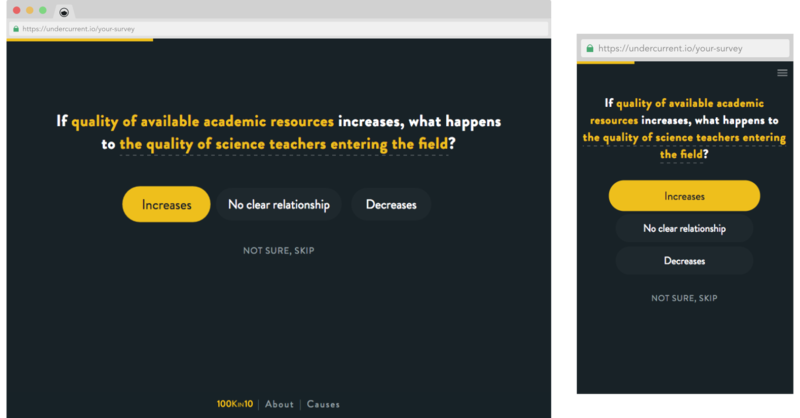 uses Undercurrent to crowdsource information from hundreds of experts and build a comprehensive map of “what causes what” in the STEM teaching system. This data is then used to pinpoint the subset of root causes that, if solved, are likely to have the biggest impact. Interested in a custom survey? Let us build you the perfect survey to harvest the insights you need to tackle whatever issue you’re facing. Set up a free consultation by emailing insights@undercurrent.io.